I’ve got to admit, I’ve been pretty unproductive lately in the bread-making department. I don’t think I’ve actually baked a loaf since before Christmas. I see where you think this is going. I’m losing interest/motivation/the will to bake… well, just hang on a second, don’t go rushing to conclusions like a half price Selfridge’s Sale! The fact is I was backpacking in Europe for three weeks. Anyone’ll tell you that youth hostels aren’t really conducive environments to home baking, or cooking full stop. I mean, I think a lot of the people I met really pushed their boundaries by tossing a jar of pesto with some penne. That’s great. I didn’t. Getting back home and actually cooking again, like really cooking, was heavenly. The same would and could be said for baking, no doubt, but other than making a mean pizza (if I do say so myself – part of the secret is a dusting of polenta or semolina flour on the bread stone/pan) last night, I haven’t actually made any bread. But, then there was Jim. Jim is my starter, and he is precisely 6 days and 4 hours old. Why Jim? I don’t know. I thought I should name my starter at any rate, seeing as I put in at least as much effort into feeding him as any (negligent) mother would her own baby. And true to negligent mother form, I picked the first monicker that came to mind, a name that I don’t even particularly like. Jim. But it sort of stuck regardless. So yeah, I’ve finally kicked off my starter, and wow, it really is like a tiny slice of motherhood, less the crying, teething, crapping et. al. What’s not to love? 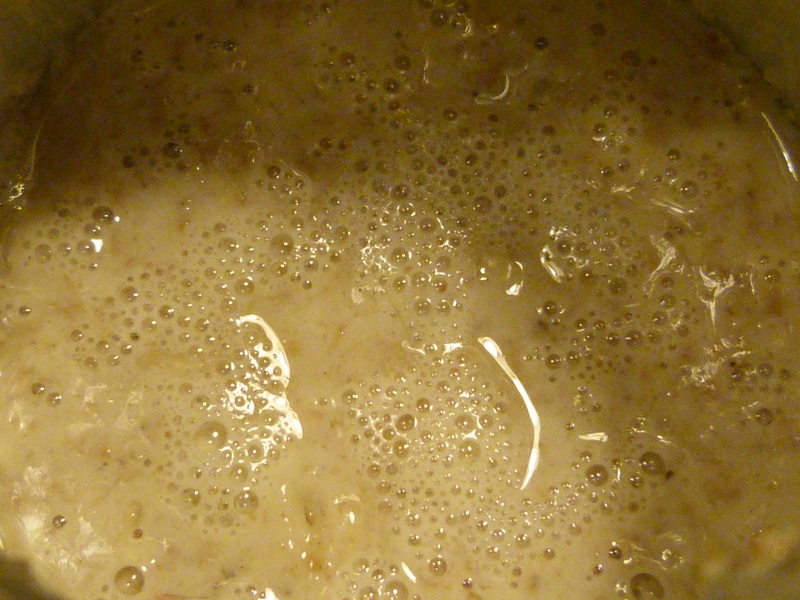 Every single morning when I come downstairs to find that it’s still bubbling away, I feel a little burst of pride. The only awkward thing is I’m going to have to get my brother to babysit Jim while I’m away in France later this month. He’s been tending to his own starter now for a few months, so at least he won’t accidentally chuck Jim in the bin. Nevertheless, it’s always going to be hard to entrust my culture to someone else! 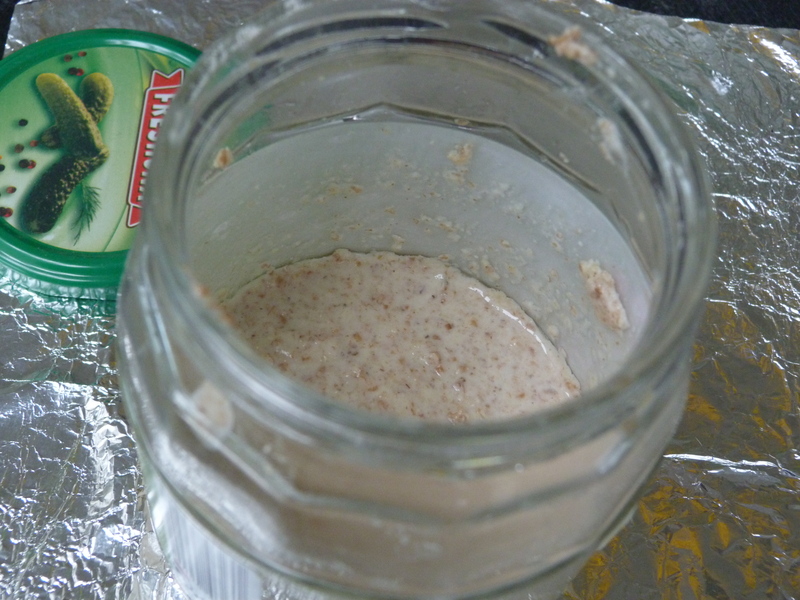 Anyway, Jim started off as a mixture of 100g dechlorinated, tepid water (if you have mains water, just let it sit, or simply use bottled water) and 100g flour (25g wheatgerm, 50g wholemeal, 25g plain). I’ve been working off Wild Yeast Blog’s great step-by-step guide, but subbed in a little wheatgerm just to give Jim a healthy kick start. 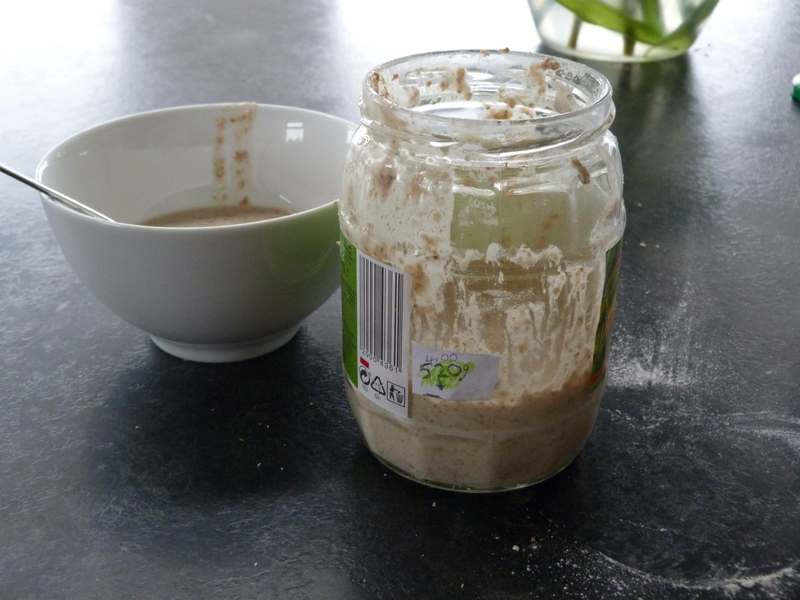 Apparently the wild yeast in question is found in the unrefined wholemeal flours and wheat products. As for my feeding process, just check out the blog for a rough guideline.. But don’t worry: I haven’t been religiously using 1:1:1 ratios of starter to water to flour – sure, I approximate the weight with scales, but as long as the quantities aren’t wildly out, then you’re probably good to go. For what it’s worth, my starter’s been incredibly well-behaved. We’ve had no false starts. What can sometimes happen, apparently, is that within a couple of days the starter can enthusiastically double in size, suggesting a miracle growth. It doesn’t actually mean that the starter’s ready to bake with, though, or even that the yeast is necessarily activated. It’s bacteria called Leuconostoc that’re responsible, providing the sudden rise and the subsequent collapse, making the starter appear to die. Which would put me in a bad mood for a good hour at any rate. Other than an initial burp of alcohol on Day 2, Jim has been a pleasure. In fact, I reckon he’s almost ready to bake with. My starter’s moving on up in the world! By tomorrow, I think I’ll only be feeding him plain white flour. Oh my, how they grow. So call me a crazy starter lady, but I genuinely like caring for my colony. Plus, I think it’s already helping me to understand the dynamics of yeast a bit better, if my pizza dough was anything to go by. Anyway, leave a comment if you want to share your own experiences with starters, or want to test my limited knowledge with a question or two!